After-Sales Service: Free spare parts in warranty time, instruction manual, video and training will be provided. Packing: Inner Packing: Plastic film wrapping around the machine. Outer Packing: Plywood wooden case. Detailed product description of our ointment making machine. Makes perfect mixing, easy to clean, save cleaning time. The pot is welded by three layer stainless steel plate and the thickness of plate can be ensured. Upper mixing motor and bottom homogenizer make pretty fine and smooth product with high gloss. The motor adopts ABB or Siemens brand. Electric heating or steam heating is optional. 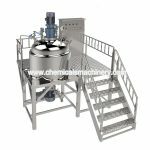 To mixing, blending and homogeneous the material when rotating in the homogenizer, widely used in industrial production for emulsification, homogenization and mixing.. The PLC automatic control box includes temperature control, frequency control and time setting control. This make you reduce numbers of labors and ensure the quality of products. The heating temperature, time and stirring speed for material can be set according to the demand. No smoke, exhaust gas, odor and other harmful gas emissions, to avoid the pollution of the environment. Made of pure stainless steel materials, and totally guarantee the food hygiene. Microcomputer digital temperature and timing control, easy to control the processing technology. Using imported high-end configuration and being made of stainless steel material, scientific and user-friendly design to ensure the long-term use of the machine. Kimyi Machinery is a professional manufacturer of cosmetic and chemical making machine for liquid, cream and other ointment. CE and ISO9001 certificates approved with GMP standard quality. ADD: Room A0168, Guangyi Time Square, Baiyun Ave North 86., Guangzhou, China. Copy©2017 | Guangzhou Kimyi Machinery Equipment Co., Ltd. All Rights Reserved.